ARROW 460 Granturismo is the first motor yacht built by Silver Arrows Marine Ltd., a company established in 2011 by a group of yachting industry professionals with a long-held dream to reinvent the motor yacht through innovation, technology and unique collaborations with world-class designers and suppliers from both within and outside the marine industry. ARROW460 Granturismo has been created in collaboration with Mercedes-Benz Style – the design arm of Daimler AG – and introduces automotive inspired design language, ideas and materials for a completely fresh interpretation of the luxury motor yacht. This boat enters a sector of the market that has seen few genuinely new models or innovations in the past decade. Designed and built as much for comfort as speed, ARROW460 Granturismo is powered by refined and efficient twin diesel engines, with the latest navigation and handling technologies ensuring the yacht is easy and safe to manage, even in inexperienced hands, right up to its top speed. The boat is designed to achieve 38 knots in light load conditions, with a cruising speed of 26 knots. The design of ARROW460 Granturismo speaks for itself: with its coupe-like elegance it is the marine cousin of the latest Mercedes-Benz models, such as the S-Class Cabriolet. A feature line descending gently towards the stern distinguishes the yacht’s profile in just the same way the hallmark Mercedes “dropping line” distinguishes the cars. The concave and convex interaction along the entire flank creates a hull that conveys both dynamism and serenity. Underlining the yacht’s design uniqueness, the bow section is upright and emphatically three-dimensional. The overall composition is accentuated by elegantly styled yet functional fittings while attention to detail is second to none: the handrails, for example, are perfectly integrated into the exterior. Also perfectly integrated is the forward built-in sunbed. 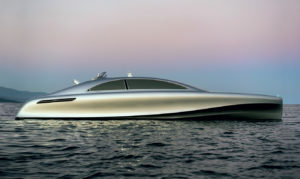 Mercedes-Benz Style was responsible for the design, furnishings and colourways of the yacht’s interior. 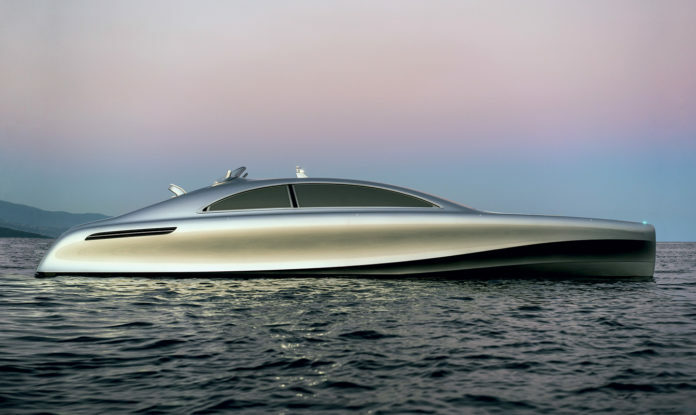 Working to Silver Arrows Marine’s brief of an open and highly versatile space, the Mercedes-Benz Style designers came up with a radical new look for a 14m motor yacht, one that reflects the hallmark values of a Mercedes-Benz automobile. The bright, uncluttered interior design is defined by the use of exquisite materials such as nubuck leather and eucalyptus wood panelling, its veneers tridimensional for a look as sculptural as it is functional. A stunning combination of blue nubuck and white aniline leather is used for the seating areas, with white aniline leather for the drawers. The modern-luxury ethos embodied by ARROW460 is reinforced by highly contemporary synthetic materials, such as mesh fabric on the backs of the built-in seating areas, the inspiration for which can be seen in the Mercedes-Benz F800 concept car. In place of the expected wood the yacht’s decking is made of synthetic material that saves weight and allows more creative freedom, enabling the designers to create an entirely new look. The innovative interior concept combines the characteristics of an open boat, with its close connection to the sea and the sky, with those of a closed cruiser. For Silver Arrows Marine, it is “loft living” on the water and has been one of the defining features of the yacht since the very first drawings. Every detail inside is bespoke, including even specially designed hinges, in accordance with the no-compromise approach. The generously dimensioned interior dispenses with a traditional motor yacht’s compartmentalised layout and instead features a multifunctional and largely open-plan area. The concept for this – and key features such as the double console helm and single floor level – was established from the start by the famous italian naval architect Tommaso Spadolini. Dining table, television and bed are all incorporated into a single unique structure and remain hidden until they are needed, when they effortlessly slide into position. With glazing forming such a key part of ARROW460 Granturismo’s design, paralleling as it does the cabin of a luxury car, the choice of supplier was always going to be a crucial one. 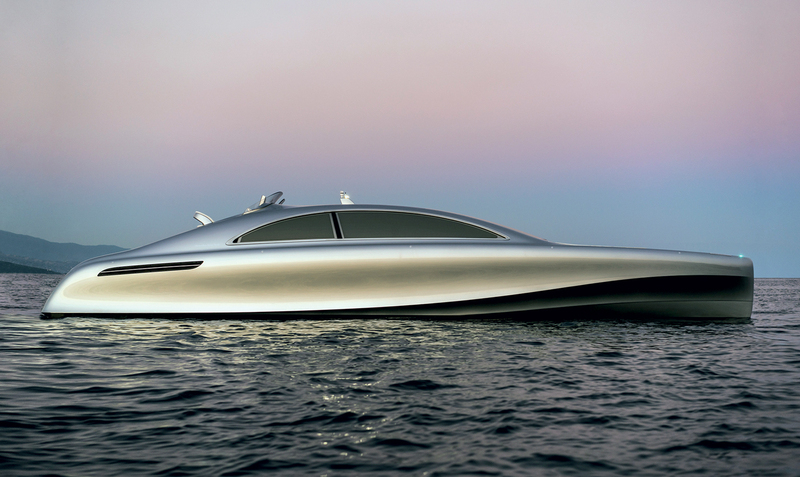 Silver Arrows Marine started working with the French company Vision Systems in 2014 and together they have developed a state-of-the-art dimmable glazing solution that is one of ARROW460 Granturismo’s unique stylistic and technological features. Using suspended particle technology, the windows adjust their transparency electronically from dark to light at the press of a button (or via an app on tablet computer). This ensures comfort levels inside ARROW460 Granturismo are maintained, however strong the sun. From outside the yacht, the glazing’s silver fabric lamination perfectly fits the yacht colour scheme as well as offering privacy for those on the inside. The kinematics of the lateral opening windows – which are 3m x 75cm and weigh 220kg each – proved a particular challenge. The answer lay in using a customised “plug and play” solution with bespoke high-end technologies, arrived at after months of digital simulations and risk analyses. The five-square-metre front roof section is made up of three dimmable glazing panels, allowing simultaneous or independent control. The 260kg section rises up on hydraulic rams to reveal a one-metre wide space that opens the cabin to the sea breezes – while retaining the all-important UV protection. With the “pergola” in place and side windows open, the yacht offers an open-air feeling unique for a motor yacht of this size. ARROW460-Granturismo’s power system employs twin diesel engines: Yanmar’s six-cylinder unit with 24 valves and maximum output of 353kW (480hp) at 3300rpm. As well as impressive power, the engine displays the low NVH (noise, vibration and harshness) that is the essence of any true Granturismo. The power system is easily controlled by the Express Joystick System (EJS) from Twin Disc, which is a standard feature of this boat. EJS gives instant access to full or incremental power in any direction by simultaneously controlling engines, transmissions and thruster via a single multidirectional joystick. Twist and push the stick in any direction and the yacht goes in that direction. The more the joystick is turned or pushed the faster the yacht will go in that direction. The system works instantaneously and is overridden by simply releasing the lever. The system makes even a first-timer an expert at precision low-speed control. The Twin Disc Quick Shift transmission and electronic control system at the heart of EJS also permits shockless shifting between forward, neutral and reverse, all in milliseconds. ARROW460-Granturismo’s ability to go from full forward to full reverse – without any signs of mechanical stress – has to be experienced to be believed. This marine equivalent of an emergency stop (while retaining directional control) is reminiscent of a car’s anti-lock braking (ABS) – an innovation championed by Mercedes-Benz in the SClass as early as 1978. The high mechanical specification is completed with enclosed PTO and heat exchangers, and a V-drive 15-degree angled shaft with Rolla customdesigned five-blade propellers made of NiBrAl. The bow thrusters have a hydraulic motor with counter-rotating bronze props. ARROW460-Granturismo makes life on board as convenient as possible for the owner thanks to the complete integration of the electrical and electronic architecture. Clear, easy to use touch screens and a tablet computer, echoing Mercedes-Benz S-Class display graphics, provide the main interface. For ultimate convenience, a tablet computer can control comfort functions such as the opening windows, lights, air-conditioning and dimmable glazing from anywhere on the yacht. The tablet also shows GPS positioning and provides the status of fuel and water tanks. The main panel on the twin-console helm has similarly user-friendly displays and controls, including the Express Joystick System. From here all the yacht’s primary functions – helm, engines, anchor, swim platform and gangway (passerelle) – are managed. Connectivity and data sharing are assured by the standard fitment of WINFOBOX, the first time this user-friendly new system has been incorporated into a yacht. The system can be used as an on-board media player by creating a wifi “bubble” that allows online access without the use of apps. A transmission rate up to 60 MB per second makes WINFOBOX ideal for work and leisure by allowing video, music, pictures and documents to be shared within a radius of 30 metres and more, all by simply inserting a USB key. With a carbon-fibre hull ruled out on the basis that its stiffness would not allow the yacht’s comfort objectives to be met, the main composite material used is Gurit’s Sprint ST94. A layer of dry reinforcement plied to a precast, precatalysed epoxy resin film, it is known not only for its extremely good balance of mechanical properties but also its impact performance and resistance to resin microcracking. Sprint ST94 is also excellent at maintaining the purity of the Mercedes-Benz lines thanks to a 95 degree Celsius post-cure process to ensure the composite remains more stable. The bare hull is formed of E-Glass Sprint ST94 with carbon-fibre reinforcement and weighs just 1131kg. The deck is a large single composite structure that contributes significantly to the structural rigidity of the yacht, in the manner of an automobile’s monocoque construction. The deck and the body side arches are reinforced by 24 layers of 600 gram unidirectional carbon-fibre in order to provide the most robust housing for the glazed surfaces and their complex mechanisms. The retractable swimming platform in the stern is formed from carbon-fibre Sprint ST94. Not only does this make it immensely rigid but it saves weight which, being at the aft extremity of the boat, has a positive effect on trim angle. Carbon-fibre is used for various large hatches and covers, including the hatch in the cockpit floor giving access to the engine room. In total, a large number of mouldings have been produced for a boat in the 14m class. The hull alone is made in four parts when normally for a boat this size there is just one. This is partly because so many shapes are curved and complex, but also to ensure all the parts can be replicated for production.